Any volume. Any system. Any message. Text messages have retained the ability to capture recipients' attention, well ahead of email. Build SMS into your apps, websites and software in minutes, no matter what programming language you use. Developer? Come and play with our API. SMS API. The killer features. A simple & lightweight API. All you need to SMS-enable your business. Integrating with the Esendex API allows businesses like yours to automatically send text messages in bulk from apps, websites and software – all at a low cost. Fast & easy. You'll be sending SMS in minutes. Our in-house team have developed our SMS API to be really intuitive and easy to use, including a wealth of features and the reliability that you need to build the best solution for your business. Our developer site will guide you through integrating with your application. You’ll find sample code, documentation and plenty of hints and tips, so you’ll be sending SMS in no time at all. You can set a from address to let recipients easily identify who a message is from. The originator can include up to 11 alpha-numeric characters, such as your company or brand name. Track messages. Your app responds. Our Push Notification service allows your apps to receive automatic updates when a message has either arrived at its destination, failed to reach its destination or you have received a message from somebody else. Alternatively, you can simply request the current status of messages at any time via our API or Echo, our web-based platform. 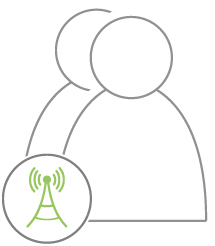 Do you prefer to use SMPP when connecting to SMS suppliers? By connecting through the Esendex SMPP API, you will benefit from our direct connections, excellent customer service and message reporting - you'll also be connecting to our SMS platform in the way that suits you. SMS API. Frequently asked questions. At Esendex we pride ourselves on our security and reliability and have taken a number of measures to protect all data to the highest standard. We are ISO27001 certified – an independent security standard setting a framework for establishing, operating, reviewing and improving Information Security Management. This ensures all customer data is protected to the highest standard, so you can rest assured that all your details are safe with us. Can I send SMS and be GDPR compliant? The short answer is yes; if your message is transactional (i.e. an appointment reminder, delivery notification, business continuity or staff rostering), or a marketing message intended for people with whom you have an existing customer relationship, you can continue to send SMS without needing consent (you must, of course, provide an opt-out on all marketing messages). When it comes to people with whom you do *not* have an active customer relationship, text message communications fall under the same PECR requirements as email communications. You should get permission from prospects to receive SMS notifications prior to any sends, as well as providing opportunities to change their preferences and opt-out at every opportunity. For more information on how to stay GDPR compliant with SMS take a look at our guide. How quickly are my messages sent? Very quickly; the Esendex messaging system is monitored both internally and externally and then measured against availability, performance, service incidents and planned maintenance to ensure a consistently excellent performance. As part of our SLA, we commit to 90% of your messages being processed within 5 seconds and 95% within 20 seconds. Our performance consistently exceeds our service promise, providing you with the best possible service. During office hours we have a dedicated technical support team on hand to help you with any queries you may have, completely free of charge! Alternatively we offer a 24/7 support line - this is a chargeable service. Discover more in our customer stories, white paper and FAQ pages.